The last topic to cover in my continuing blog is the sustainability aspect of the Restaurant Technologies system. The global warming argument, whether you agree or disagree, is a subject for another person to tackle. What we can do is help you become sustainable and save money at the same time. As a restaurant owner, manager, or general manager, I would think the last sentence would be music to your ears! How can we do this you ask? Much of the savings lies in the jugs of oil you currently use to fill your fryers, or rather in getting rid of those jugs. Let me expound with an example: I was visiting with a potential customer who uses approximately 700 pounds of oil a week (we deal in pounds of oil at Restaurant Technologies not gallons) or 20 oil jugs a week. Those 20 jugs take up a lot of time and space. From a labor prospective, the “life cycle” of the jugs is considerable in terms of time and labor. They have to be unloaded and put away when they are delivered from the supplier, located and removed from the shelf when you need to fill them (usually the shelf is not near the fryer), and then broken down and thrown away. What if you could take all of those actions and simplify them with the push of a button? You have not only kept the packaging out of a landfill but you have trimmed the time taken for cooking oil related tasks. The other often overlooked positive aspect of the restaurant technologies system is at the dumpster. It isn’t cheap to have your garbage picked up so wouldn’t it be nice to have the garbage truck come with less frequency or decrease the size of your dumpster? The customer above would save the equivalent of eight dumpsters a year by using the Restaurant Technologies system. By eliminating jugs of oil, they could schedule fewer pick-ups or go down a size. 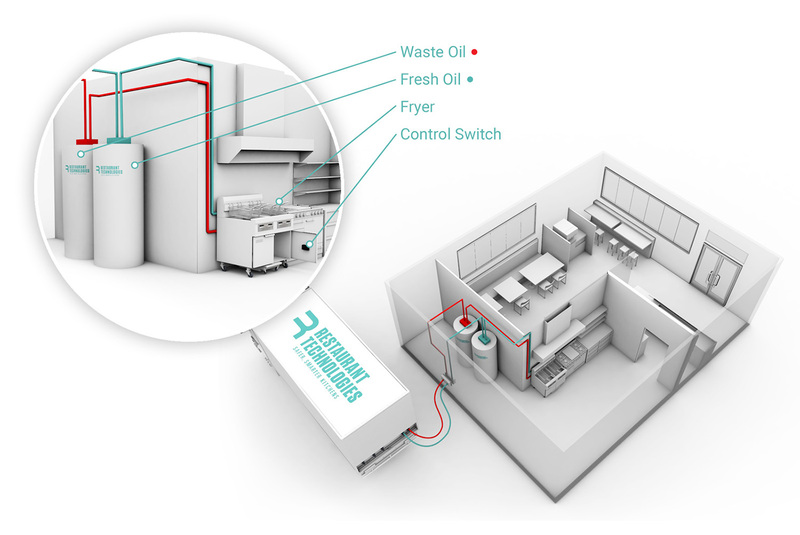 As you can see, it is possible to make your restaurant more sustainable and environmentally friendly while saving money. Give Restaurant Technologies a call today and we can show you the best of both worlds.